When I was in Jamaica I drew a picture of this Jamaica's National bird using pens and watercolor pencils. I can't get enough of this colour palette! Enjoy this video of how to draw a simple Unicorn Latte with pens and watercolor pencils! I had such an amazing time transforming these wooden shapes from Michaels into a traditional South Indian Chettiar doll set, which we often dsiplay over Navrathri. I used e6000 glue to secure the large and small balls, and to secure the lentils and beans to the "pots". The dolls are less than 10 CM high, with the pots standing at just about 2cm. This past weekend I created two pieces of art for a Charity Auction in the office. The float frame I got for the elephant was totally worth it and it really brought out the art. The bell was my second dabble in what I had earlier called "Lace overlay". 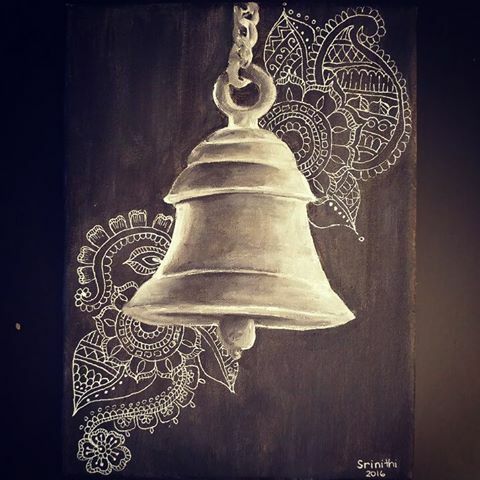 The sound of the bell in a temple or church creates a beautiful deep intricate sound that fills the air around it, which is what I was trying to depict with this painting. It is customary in South Indian culture to draw little feet leading up to an Idol or Photo of Krishna on Krishna Jayanthi (Lord Krishna's Birthday), to represent baby Krishna entering the home. We live in a really small condo and I really wanted Krishna Jayanthi Decor that we could easily store and use every year. I decided to paint little 3.5 inch feet (I know they look a lot bigger!) and decorate them with a henna like motif. I also painted a gorgeous colourful Henna Mandala Kolam for our little Krishna Figurine. I tied the whole thing together with a 5x7 print of an old Krishna and Radha drawing and some home made Kesari. I hope everyone is enjoying their Navrathri! My husband moved into our condo with just two suitcases and the gigantic Superman Painting he commissioned from me. For over a year, the 30x40" Superman Painting found it's home over our bed. I finally got a chance to paint something to replace it! We went to Positano on our honeymoon and it was stunning. This was really a challenging painting, but it felt so good to see it come to life. 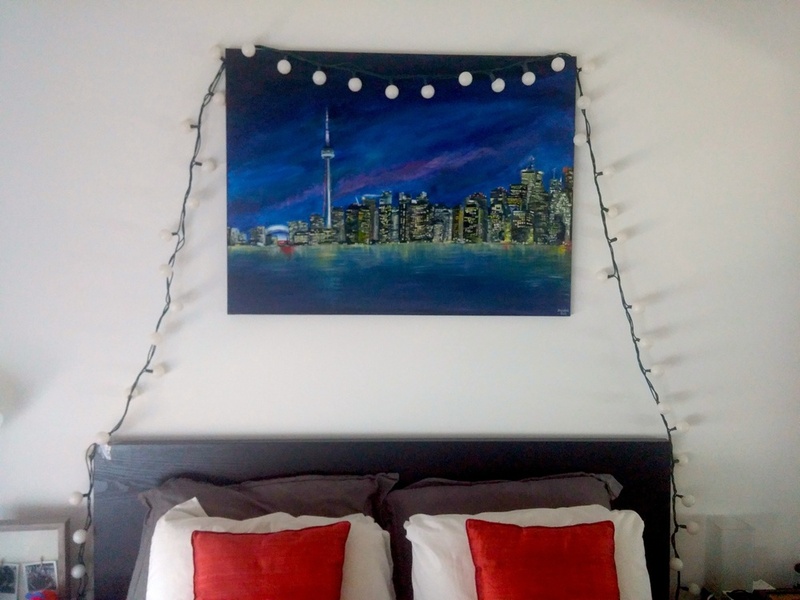 We hung this painting in our Living Room, moved our Toronto Skyline Painting over our bed, and I said good bye to Superman! I could not be happier! MLR Photography took a few gorgeous photos of me at work. Thanks for the fun experience Hina & Sunny! On March 17, 2016 I participated in my first Art Showcase for over 700 people at Maison Mercer in Toronto. RAW Artists is an amazing organization that is committed to showcasing emerging artists in cities across the world! The venue, organization, crowd, and experience were phenomenal. It was very special to have the support of my husband, sister, parents, and close friends.